With the season of the holidays in full-gear, this past weekend found many of us pulling out and untangling strands of indoor and outdoor lights, dusting off hibernated ornaments and decorations, checking off items on our shopping lists, and reacquainting ourselves with favorite carols and Dr. Seuss movies. To help assist you amongst this hustle and bustle time, today’s blog provides some wonderful ideas to festively decorate your front doors. So much so that, bells will be ringing! Handmade Christmas paper mache ornaments are quirky and oh so charming! Feature them inside a custom painted frame and you’ve got yourself a “wow-factor” door decor. Click here for “how-to” instructions. Photo courtesy of bluecricketdesign.net. So simple. So beautiful. A perfect rainy/snowy day project for you and your kids. Trace out circles with the bottom of a glass, put on some holiday music, and enjoy the process. How-to: Once the circles (including berries) are cut out, 1. first glue a strip of ribbon down onto the center of a cardboard disc. 2. Begin gluing the cut-out circles onto the cardboard disc to create the outer-most circle. 3. Go back to the center and glue on an inner circle. 4. Using double stick foam, attach a narrow cardboard circle just inside and onto the outer circle (as shown on the picture) to create a 3-D affect; this is where you’ll glue the next ring of cut-out circles. 5. For the final ring of circles, repeat #4, but stick the cardboard just inside and onto the 2nd tiered ring (as shown). Photo courtesy of re-nest.com. Not sure what to do with all those beautiful holiday cards? Display them for all to see using beautiful ribbons, handmade bows, and double-stick tape. Photo courtesy of countryliving.com. 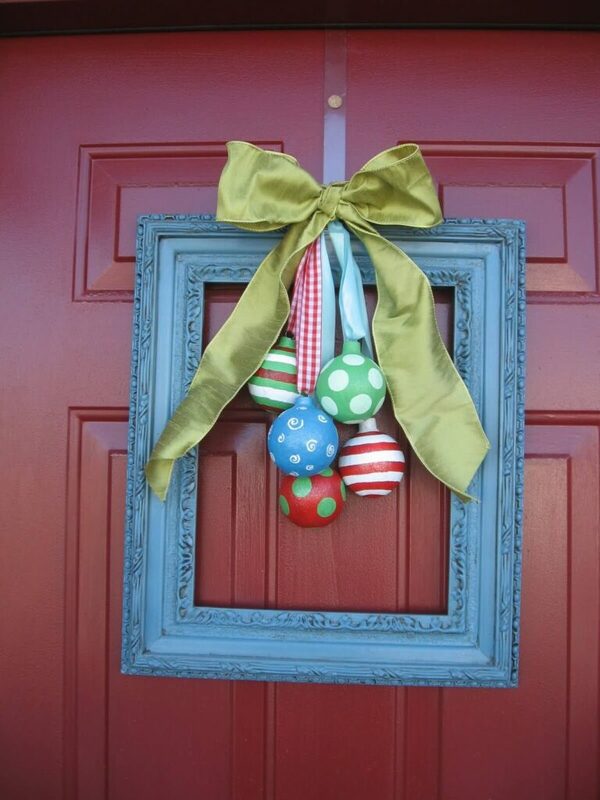 Neighbors will be “green” with envy at this recycled ornament wreath. Using a simple glue gun and straw wreath, attach different ornaments to cover. Photo courtesy of bakati.com. Re-purposed stocking cap and gloves make for this absolutely darling door deer. With easily acquired materials like pine cones, ribbon and felt, Santa will surely be coming to your town. Photo courtesy of azildalions.ca. Celebrate the festival of lights with this unique and beautiful yarn/felt wreath adorned with blue winter flowers. Photo courtesy of etsy.com. Kids will be calling when you display this delicious door decoration. Sweet thing is…you can substitute many confectioner favorites such as marshmallows, green and red or blue and white M&Ms, gumballs, etc. Photo courtesy of thoughtfullysimple.com. Post written by Skaie Knox.